Their exchanges showcased the intense and unpredictable new phase of the race as polls tighten and 11 candidates jockey for political advantage — not only over issues like imposing tariffs on Chinese goods and fighting the Islamic State, but also over matters of character and integrity that drew some of the hardest punches of the race so far. In many ways, it was the darkest debate of the campaign, as the Republicans tried to paint the grimmest possible portrait of an America in decline economically, despite rapid job growth, and militarily, though they praised service members. The ferocity onstage reflected the pressure in the race as it distills into a contest between the anti-establishment Mr. Trump and Mr. Cruz, followed by other candidates like Senator Marco Rubio of Florida and Gov. Chris Christie of New Jersey. Mr. Rubio and Mr. Christie, along with Jeb Bush and John Kasich, are vying to emerge as the leading candidate of mainstream Republicans, yet they struggled to be heard on Thursday night. Mr. Cruz, who has gained ground against Mr. Trump recently and is now virtually tied with him in the polls in Iowa, charged that Mr. Trump was turning desperate because his standing as front-runner had turned shaky. After months as Mr. Trump’s closest ally in the race, Mr. Cruz pointedly noted that Mr. Trump had dismissed questions in the fall about Mr. Cruz’s constitutional eligibility given his birth to an American mother living in Calgary, Alberta. “The Constitution hasn’t changed, but the poll numbers have,” Mr. Cruz said. “Donald is dismayed that his poll numbers are falling in Iowa.” Mr. Cruz added that the law was on his side, noting that Senator John McCain, while born in the Panama Canal Zone, was eligible to run for president. By Mr. Trump’s standard, Mr. Cruz asserted, Mr. Trump himself might not be eligible to run for president because his mother was born in Scotland. “But I was born here — big difference,” Mr. Trump said. Mr. Cruz gave his most aggressive performance so far as he sought to protect the support he has built among social conservatives and evangelical Christians. He was relentless in trying to put Mr. Trump in his place, in part to appeal to establishment Republicans who are deeply uncomfortable with Mr. Trump’s candidacy. The debate turned from a reality show into a comedy as Mr. Trump mused that if he chose Mr. Cruz as his running mate, Democrats would sue to challenge Mr. Cruz’s eligibility — as they would, he said, if Mr. Cruz won the presidential primary. “If you become the nominee, who the hell knows if you can even serve in office?” Mr. Trump said. Mr. Cruz, a pugnacious, polished debater as a Princeton undergraduate, gave no quarter. “I’m not going to take legal advice from Donald Trump,” he said to laughter. And he offered to make Mr. Trump his running mate, so he could assume the presidency if a theoretical legal challenge against Mr. Cruz’s eligibility were successful. Mr. Rubio, seeing an opening to position himself above the spat, eventually interjected, mocking his rivals. “I hate to interrupt this episode of ‘Court TV,’ ” he said, drawing laughs and applause. He then sought to refocus the conversation on President Obama’s shortcomings and what he said was a need to revive the country, safe terrain for Republican primary voters. Neither Mr. Rubio, who spent most of the debate delivering rehearsed lines that seemed to come out of speeches, nor the other four Republicans on the debate stage left nearly as big an impression during the night as Mr. Trump and Mr. Cruz. Mr. Cruz stood by it, saying Americans outside New York City understood the reference. “I think most people know exactly what New York values are: socially liberal, pro-gay marriage, pro-abortion, focused on money and the media,” he said. But Mr. Trump, in an uncharacteristically calm and measured answer that built to a powerful conclusion, recalled the way that New Yorkers suffered, grieved and recovered from the Sept. 11, 2001, attacks — drawing applause even from Mr. Cruz. Mr. Bush — who had his best debate last month when he doggedly criticized Mr. Trump, but saw little bounce in his poll numbers in New Hampshire — took another pass at Mr. Trump when he urged him to “reconsider” his proposal for a temporary ban on Muslims entering the country. But Mr. Trump refused. “I want security for this country, O.K.? I want security,” he said. He denounced the shootings last month in San Bernardino, Calif., and said it was a “serious problem” that no one had reported suspicious activity by the Muslim couple under investigation for the killings. “Why didn’t they call the police?” Mr. Trump asked of the couple’s neighbors and others. Mr. Cruz, like other candidates, repeatedly attacked President Obama, criticizing his omission from his State of the Union address on Tuesday any mention of the Navy sailors who were temporarily detained by Iran this week. “It was heartbreaking, but the good news is, the next commander in chief is standing on this stage,” Mr. Cruz said. His rivals joined in, trying to keep the focus on Mr. Obama and Hillary Clinton. The candidates also sought to find provocative new ways to tar Mrs. Clinton. “If she gets elected, her first 100 days, instead of setting an agenda, she might be going back and forth between the White House and the courthouse,” Mr. Bush said, drawing applause. Mr. Rubio also seized an opportunity to challenge Mr. Christie’s conservative credentials on a host of issues important to party activists. Mr. Christie responded with ridicule, recalling that Mr. Rubio had repulsed an attack from Mr. Bush at an earlier debate by suggesting that Mr. Bush had been told to criticize him out of desperation. Mr. Cruz replied with mockery. “I appreciate your dumping your oppo research folder on the debate stage,” he said, referring to the compilation of vulnerabilities campaigns keep on their rivals. He said Mr. Rubio’s accusations were “flat-out false,” drawing boos from a crowd friendly to Mr. Rubio, and then invoked a cast of politicians well-known to Republican primary voters. “Marco stood with Chuck Schumer and Barack Obama on amnesty,” he said. “I stood with Jeff Sessions and Steve King,” two immigration hard-liners in Congress. Mr. Cruz’s bank loan was the focus of a Times article published Wednesday night, which reported that he and his wife had borrowed up to $1 million from Goldman Sachs and Citibank during his 2012 Senate primary race in Texas. Mr. Cruz did not disclose the loans on campaign finance reports, as required by law. During that race, he railed against Wall Street bailouts and the influence of big banks in Washington, a populist, outsider message that is also central to his presidential campaign. After his 2012 victory, he said in interviews that he and his wife, Heidi, had sacrificed “all we had saved” by putting personal funds into his Senate campaign. Near the end of the debate, the disputes took a turn toward the substantive as Mr. Rubio, unbidden, targeted a business tax proposal by Mr. Cruz, calling it a value-added tax. Mr. Cruz countered that Mr. Rubio’s tax plan would leave the Internal Revenue Service in place. After one exchange between Mr. Cruz and Mr. Rubio, Mr. Christie saw an opportunity. “I’d like to interrupt this debate on the floor of the Senate,” he said, pointing out that the original question had been about entitlements. 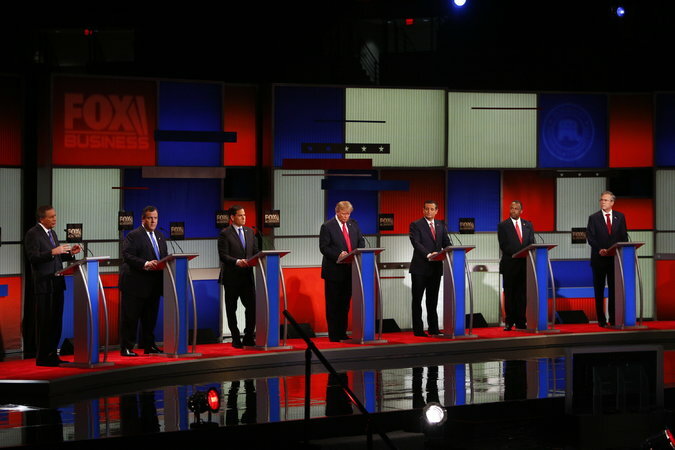 Mr. Rubio sought to retake the floor, but Mr. Christie cut him off. ← I AM OFF AND RUNNING ONCE AGAIN ! !